On 29th and 30th September we held teacher training sessions. 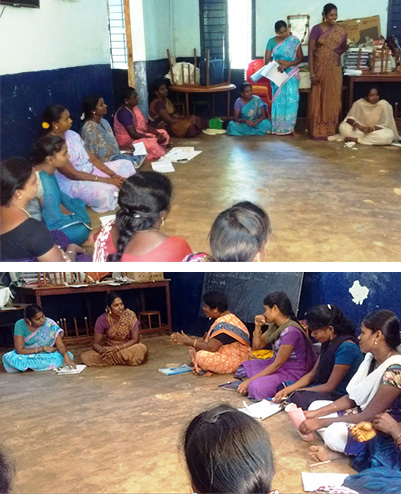 On 29th September the organisation AID-India organised a classroom management session in Vedanthangal. Both trainers and teachers participated in a round table to discuss the problems they face at the tuition centres and talked about different techniques in order to solve these problems. The trainers also discussed a number of techniques used at AID-India schools to reinforce the students’ positive behaviour and deal with negative attitudes. On 30th September a teachers’ competition was held in Vandavasi. The teachers were asked to solve maths problems and take part in a Tamil writing activity, followed by mental arithmetic and jigsaws related to basic mathematical concepts.